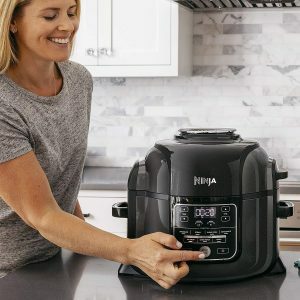 Black and gray Ninja Foodi OP301 is a number one new release, modern multi cooker with the TenderCrisp technology and a 1400-watt power for pressure cooking, for air frying, broiling, baking, roasting, searing, sautéing, slow cooking and steaming. It scores 4.4 out of 5 stars by 35 customers, which is a decent satisfaction score. And there are many answered questions that you may look through on Amazon.com. Ninja Foodi las a large 6.5-quart size pot and a special design pressure and a crisping lid. Your meal will be cooked quickly and properly and will get a golden and crispy exterior with the crisping lid. This special design cooker will air fry your ingredients with very little oil to get meals with 75% less fat and will cook your ingredients 70% quicker than conventional methods as a great pressure cooker. These are not random guesses but the results of tests against low-simmer, braised and slow cooked and the deep-fried hand-cut fries. The large 6.5-quart pot has a ceramic coating that is nonstick and free of PTFE and PFOA, which also makes it easier to clean. You can comfortably make a chicken or beef roast enough for a few people. The ceramic coated cook & crisp basket has a 4-quart size and can have about 3 pounds of fries or a large 5-pound size chicken to feed everyone in the family. It had to pass several tough tests to get the UL health certificate. And you can have a peace of mind especially in the pressure cooking mode, with its 14 levels of security. If you want to cook the frozen foods directly in this cooker, start with the pressure cooker and continue with a crisping mode. There is no need for thawing beforehand as the ingredients will be defrosted and cooked simultaneously. And all the juices will be locked in and the exterior will be nice and crispy, with both frozen or fresh ingredients. If you add hot water rather than cold water it will get to the pressure cooking temperature much faster. It also works wonderfully as a slow cooker and you do not need to use different pots to sear or brown the meat either. A single non-stick pot is easy to clean and maintain and there won’t be much mess in your kitchen. Many of its parts like the silicone gasket are dishwasher-safe, but the pressure lid isn’t. In the box you’ll get the 6.5 quart pot and 4 quart cook and crisp basket, both of which are ceramic coated, a stainless steel reversible rack, a cook and crisp layered insert and a recipe book of more than 45 recipes. 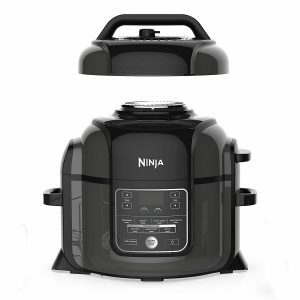 The black and gray Ninja Foodi has a modern design, weighs 30.8 pounds and measures 16 x 12 x 10 inches. The difference between the OP301 and OP302 is that the 301 does not have the dehydrator option, but the 302 (and the previous 305) does. Whichever model you pick, these multi-functional cookers will take the place of at least three cookers. The Ninja Foodi makes an awesome addition to any kitchen, with its sturdy construction, flexibility and beautiful design and appearance. It is very easy to operate and achieves heaps in much less time. You can expect many years of use from it if you take good care of it. And the customer support is pretty good when you have any problems or questions. We are happy to recommend this multi cooker as it offers quite a lot, at a reasonable price.